A vacation in the Odenwald promises a variety of interesting experiences. The low mountain range landscape stretches across over 2.500 km² between the rivers Neckar and Main. The Odenwald is practically meant for hiking and bicycle trips. In the winter, the mountains are perfect for ski tourism, for example on the 626-meter-high Katzenbuckel. As the highest peak in the Odenwald, this extinct volcano towers over the Neckar valley. The Bergstraße (mountain road) starts on the western slope of the Odenwald. Beautiful winegrowing areas can be found here, as well as extensive parks and magnificent outlook points. The tourist center of the Odenwald is the small town of Michelstadt. The best-known architectural treasure in the picturesque old town is the city hall, a 15th century half-timbered building. The Odenwald Museum offers a variety of fascinating insights into the culture and history of the vacation region. In the Steinbach quarter, the Einhard basilica rewards a visit. This 9th century basilica offers impressive testimony to Carolingian architecture. In the southern part of the Hessian Odenwald district, we come across the idyllic town of Beerfelden, with about 6.400 residents. The Mümling fountain bubbles out of the Zwölfröhrenbrunnen (twelve-pipe fountain) on the marketplace. In the surrounding restaurants and cafes, one can while away pleasant hours. In the more than 750-year old Amorbach, one should not miss a visit to the rococo-style St. Maria Church. The town of Walldürn in the Neckartal-Odenwald nature park enjoys the reputation of a pilgrimage site. The pilgrimage Church of the Sacred Blood was constructed in 1729. South of Darmstadt stands Burg Frankenstein, whose name achieved fame above all through Mary Shelley’s popular novel Frankenstein. Burg Frankenstein was first documented in 1252, but the year of its construction is uncertain. The castle was named for the aristocratic Frankenstein family, which inhabited it for many centuries. The various parts of the castle were built in very different epochs and lend the structure a unique appearance. The most recent section of the castle houses a restaurant with a panorama terrace. Situated on the 370-meter high branch of the Langenberg, the Spornburg offers a broad view over the Rheine valley. On the north slope of Königstuhl mountain, with a height of 80 meters the red sandstone of Heidelberg Castle towers over the valley below. This trademark of Heidelberg dominates the cityscape and at the same time is among Germany’s most famous ruins. A castle in Heidelberg was first mentioned in 1225, and it served as a residence for the Electors of the Palatinate in the 17th century. Transformed into a fortification in the mid-15th century, the complex was expanded in the early 16th century into a castle. In the Thirty Years War, Heidelberg Castle suffered damage for the first time. Since then the facilities have been repeatedly restored, but never again expanded. In the course of the Palatinate War of Succession, the castle was destroyed in 1688. Today Heidelberg castle is one of the most popular attractions of the region and is also visited by many foreign tourists, including Americans and Japanese. 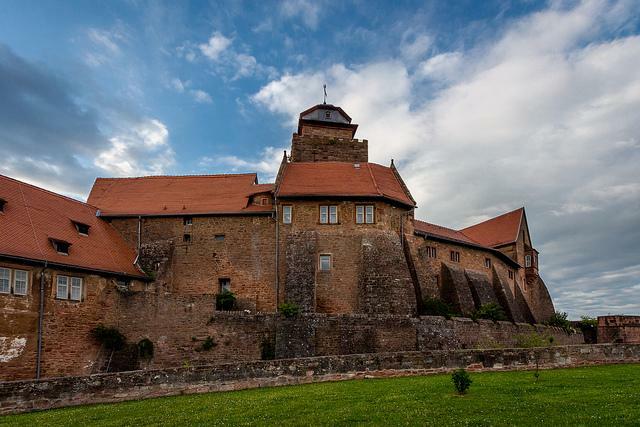 On the basis of its solid construction, Burg Breuberg is considered one of the most impressive castle complexes in the Odenwald. The well-preserved complex on the Burgberg was built around 1200 and served for a time as the residence of the Breuberg rulers. Crucial for the castle’s history were the repeated divisions of the property, which began in the early 14th century. After the death of Eberhard III of Breuberg, half of Burg Breuberg passed to the aristocratic Trimberg family, and a quarter each to the earls of Wertheim and the lords of Weinsberg. Thus, it came about that the constantly expanded castle represents an architectural ensemble from various different epochs. Gothic and Renaissance structures were among the most important parts of the castle complex. Today, the castle serves the town of Breuberg as a youth hostel and museum. The Odenwald’s natural beauties and sights can be explored on the Nibelungensteig. The route, called the “quality hiking path of Germany,“ is 124 km. long. Over peaks and through valleys the hiker overcomes a good 4,000 meters in altitude and enjoys largely untouched natural paths. The hiking path marked with a red “N” leads from the Zwingenberg on the Bergstraße to Freudenberg on the Main. The Nibelungensteig passes fascinating castles, pristine lakes and charming towns. Thus, it is worthwhile to visit the picturesque town of Schlierbach. Due to its numerous half-timbered houses, Lindenfels is one of the most beautiful villages in the Odenwald. The Odenwald Railroad in southern Hessia has been a tourist attraction since the first section of the railroad was dedicated. Already in 1872, the hereditary Grand Duke Ludwig of Hessia and his wife took a trip on the technically elaborate railroad. From Eberbach am Neckar vacationers can travel through the Odenwald to the Brothers Grimm city of Hanau. If one wants to take the stretch in the direction of Darmstadt, one boards the Odenwald Railroad in Groß-Umstadt Wiebelsbach. In 1882, the 120-km-long rail line was completed with the last segment between Kailbach and Eberbach. The route of the Hessian Odenwaldbahn is extremely charming and also offers views of numerous viaducts, tunnels and architectural treasures. Thus, it is not surprising that the Odenwaldbahn is considered a cultural monument. In the center of the town of Erbach, vacationers find the eponymous castle, which today still serves as the residence of the aristocratic Erbach family. Built in the High Middle Ages, Schloss Erbach boasts of a neo-baroque facade. The transformation into a baroque complex occurred in the first half of the 18th century. Previously the walls and trenches of the round moated-castle served defensive purposes, for example against the Croatian Cavalry in the Thirty Years War. Today visitors can view the famous collections of Count Franz I of Erbach. The extensive catalogue of the passionate collector includes an antique and medieval collection, as well as a “nature and hunting” exhibition. On the peak of the Otz mountain, the eponymous fortification from the late 12th and early 13th centuries towers over the town of Hering. Historically, the town and fortifications are closely linked. The town’s history began around 1244 as a castle workers settlement of Castle Otzberg. After an eventful history of changing owners and violent wars, the fortress was used as a prison in the 18th century. Today, vacationers find a museum, registry office and castle tavern in Veste Otzberg. In addition, between the ring wall and the Romanesque castle keep many events are regularly held, including concerts and markets. The dripstone caves in Eberstadt on the edge of the Odenwald are between one and two million years old. The cave in the city district of Buchen was accidentally discovered during blasting operations in 1971. Since then one of the most beautiful natural monuments in Southern Germany has been accessible to the public. Various stalactites, stalagmites, as well as sinter formations make up this geological wonder. The fantastic dripstone formations can be visited year-round on guided tours. The two-to-seven meter wide cave is also accessible to wheelchair users. The Eberstadt dripstone cave is part of the Eberstadt cave world, to which the Stein-Höhle and the Kornäckerhöhle also belong. These caves are, however, not yet open to visitors. In the Odenwald numerous customs and traditions have survived. Among them is ivory carving. The Ivory Museum in Erbach is devoted to this filigree craft. Today there are still workshops in the “Ivory City” of Erbach, which unlike the case in earlier generations work with fossil ivory or alternative materials. The German Ivory Museum was founded in 1966 and contains over 2,000 exhibits. Besides the works of the Odenwald ivory carvers, European ivory art is presented from the Middle Ages to the present. As well, carving arts from Africa, Asia and Greenland are to be found in this museum, which is unique in its size and nature.